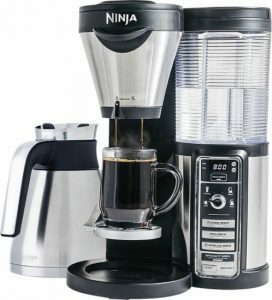 Today, Best Buy has a Ninja - Coffee Bar Brewer with Thermal Carafe Sale, $99.99 - Free Shipping. Expires Soon - $150 at amazon. Rated 4.6 out of 5 stars. The best coffeehouse in town is on your counter top with the Ninja Coffee Bar brewer. Ninja's patent-pending brewing technology is designed to deliver delicious coffee with variable richness levels and without bitterness. The Ninja Coffee Bar brewer has Thermal Flavor Extraction, which truly unlocks the full flavor potential of your coffee using automated controls for temperature calibration, pre-infusion and coffee saturation.